Time to dive in to some of the projects you spotted in Maya’s nursery reveal. First up? 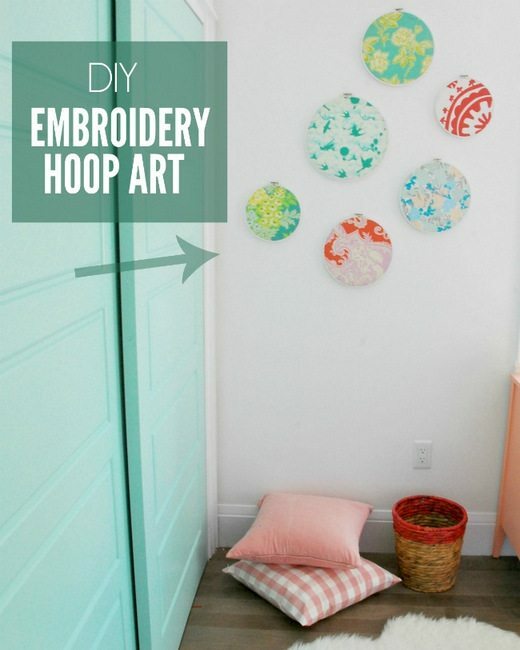 DIY embroidery hoop art. I have been wanting to do this project for AGES, and finally had the perfect spot – a corner of Maya’s nursery dying for a little colour and pattern. It’s a super straightforward project. I wanted a bright and crisp look to mine, so I decided to paint my hoops white rather than leaving them wood. I used basic white acrylic paint – two coats. 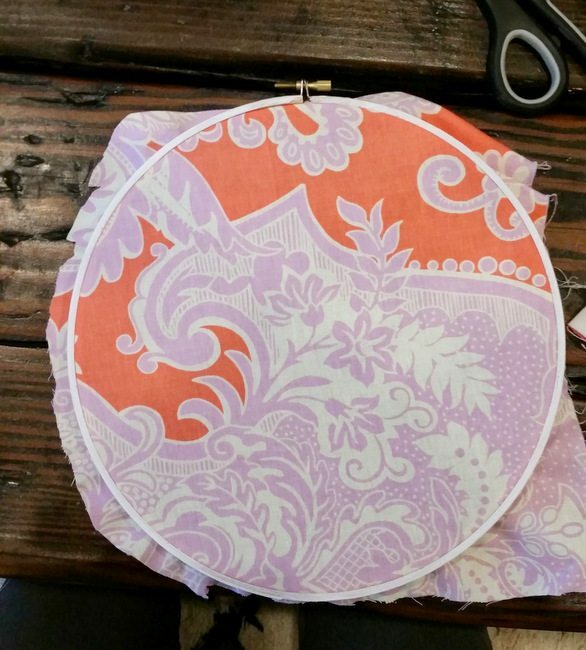 And remember – the smaller hoop will be hidden behind the fabric, so you just need to paint the bigger one. Once they had dried, it was time for the fabric. 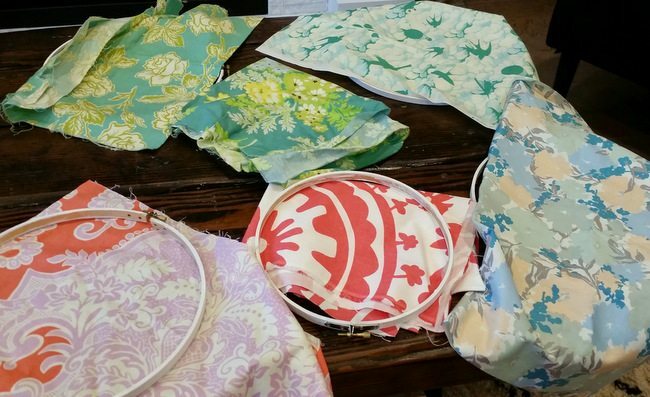 I had pulled out all of my favourite fabric scraps in the colours that I knew would work in the room, and then narrowed it down to a collection that felt cohesive. These were either remnants from other projects, or fat quarters that I had purchased. To actually put the hoop together. you just loosen the outer hoop, place your fabric on top of the inner hoop, place the exterior one over top, and tighten. Stretch the fabric so that it’s nice and tight in there, tighten the hoop as tightly as it’ll go, and then trim off the excess fabric at the back. One of the best parts of this easy peasy project is how simple it is to hang them. No level required or special hanging supplies, just a finishing nail and hammer. I hung one in the center, and then placed others randomly around it. I have mine on their own, but these could totally be mixed into a gallery wall, placed around letters spelling out your kiddo’s name, whatever! It’s a great way to bring in some pattern into a room without committing too much. Plus, if you have your eye on a super expensive fabric, buying a fat quarter is not a big deal compared to buying it for drapery or something! 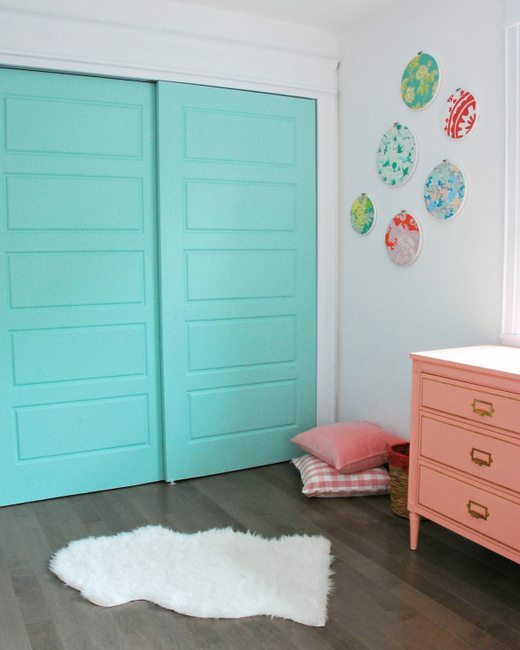 Here are all the projects from this room makeover! Cute, right? My sister-in-law did embroidery hoops with lace for her daughter’s nursery that are all kinds of sweet and have a vintage vibe to them. 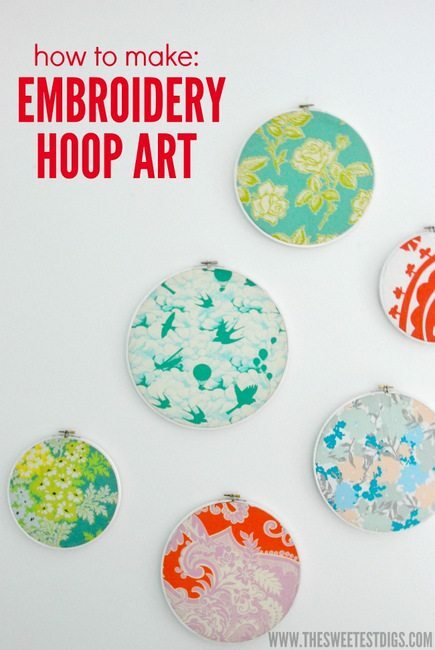 Have you done any projects with embroidery hoops at your place? Got any other favourite DIY artwork projects to share? Very cute. I never thought to paint the looms! I’ve done the same thing with a 20 x 20 ft wall covered in looms, each using various materials like fabric scraps, nostalgic shirts from my past, cheap scarves and shirts from thrift stores, and recycled clothing I never wore but loved the pattern. Most of the looms were found in one thrift store trip in one big box for $5! 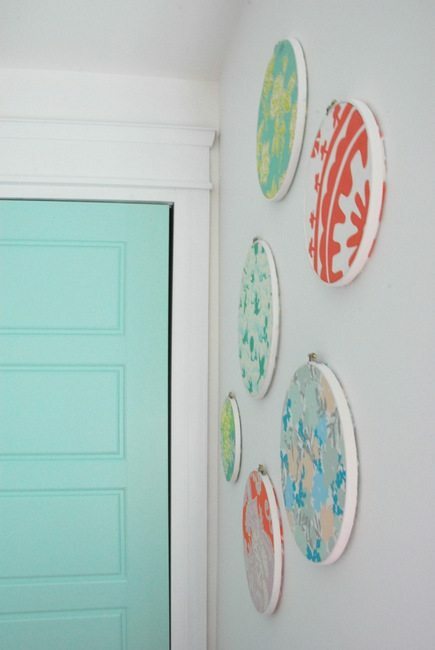 I have an older blog post similar to yours as well on my blog: http://www.whatmandyloves.com/2013/03/diy-hoop-wall-art.html (before the 20 ft wall). WOW!!! That is one amazing wall, Mandy. Awesome!